*So, I had LONG, well-written, insightful, and, yes, witty content on this page. However, the browser just ate it. I’m going to take that as a sign that the internet hates me and just go to bed. I can’t cry because the same thing recently happened to half the files on my computer and I just had some wine, so I don’t particularly care to let technology win. I can’t say that I’m going to try to put up comparable content on this page anytime soon, though. I’m really that pissed at the moment. UPDATE – I’m still annoyed and don’t even know where to start, so here’s the quick and dirty from the notes I’d written during the project. 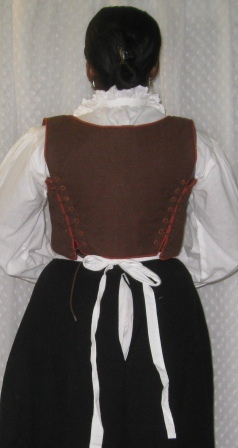 The skirt is made of black cotton linen look remnants, pieced with black broadcloth in the gores. I cut down the original pattern, removing most of the width from the center and back pieces. I also adjusted the angle of the gores to fit the small amounts of remaining fabric. I put in two knife pleats rather than gathering at the waist. I’ll add guards before it goes out. I made a mock-up in white cotton that might become a corded petticoat for my Italian project. We’ll see how that goes. 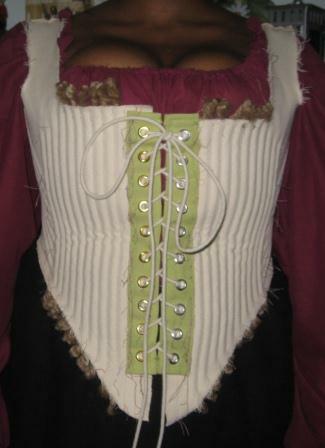 The side-lacing bodice is untabbed without shoulder treatments. It’s made of brown embroidered linen and is piped with rust cotton broadcloth around macrame cording. It is flatlined with canvas, interlined with heavy linen, and lined with brown cotton broadcloth. 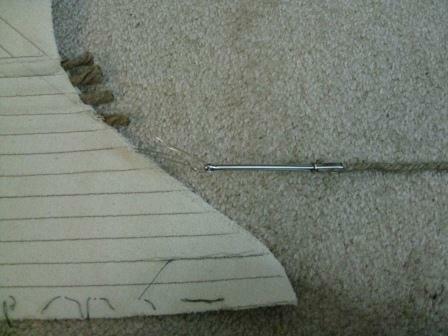 The eyelets are handsewn (badly) with brown craft thread. I’m considering switching to satin embroidery floss in the future. The bodice is too short, and I don’t like the curve of the point. I usually alter the point to a V, but I didn’t this time, just to see how it would look. I’ll wear an apron to cover the length. 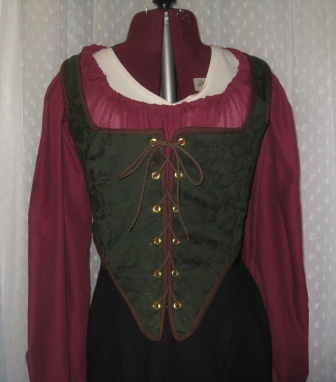 UPDATE: I’m thinking that I might wear the bodice over a floor length chemise, a la Gwen from the BBC’s Merlin. We’ll see. I love, love, love this bodice! It is so comfy, and there was no pressure to get it “right”. 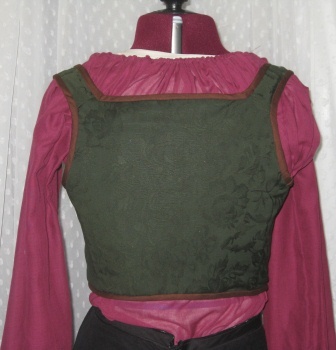 The bodice is made of a forest green stretchy damask (maybe) over two layers of unbleached canvas. Since I was using remnants, I had to piece the straps on, but the rest of the bodice is in one piece. 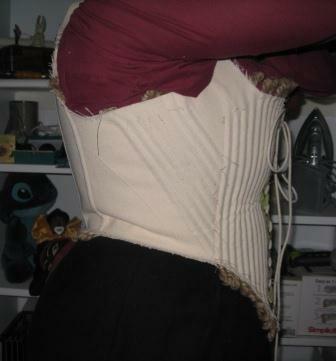 I really wanted to do a corded bodice, so this one has jute in the boning channels rather than my usual cable ties. For the long bits, I used a tube turner hooked to a bodkin, then wire to get the jute through. For the interior bits, I slashed the inner edges of the channels, pulled the jute through, then stitched across the channels. The two center channels (front edges) do have cable ties. In the fourth picture, below, you can see that there’s a slight crease at the waistline. The cable ties, added after that picture, give just a bit more stability. 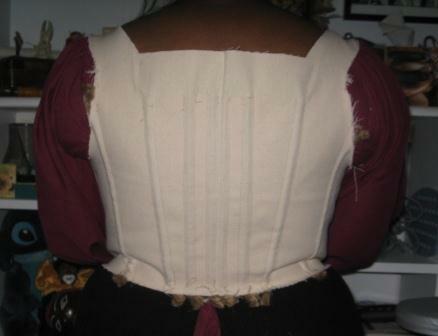 The bodice is bound with brown cotton broadcloth. 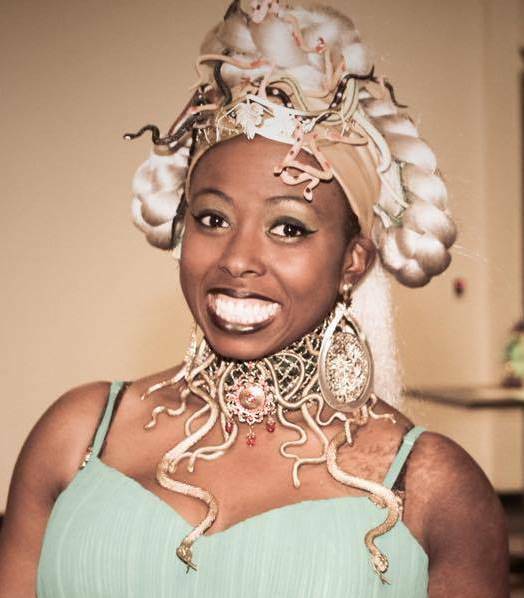 Because I wanted this to be a quick project, I didn’t line the bodice, and I used gold metal grommets. It is laced with brown macrame cording. My only issue is that I need to double the number of lacing holes. 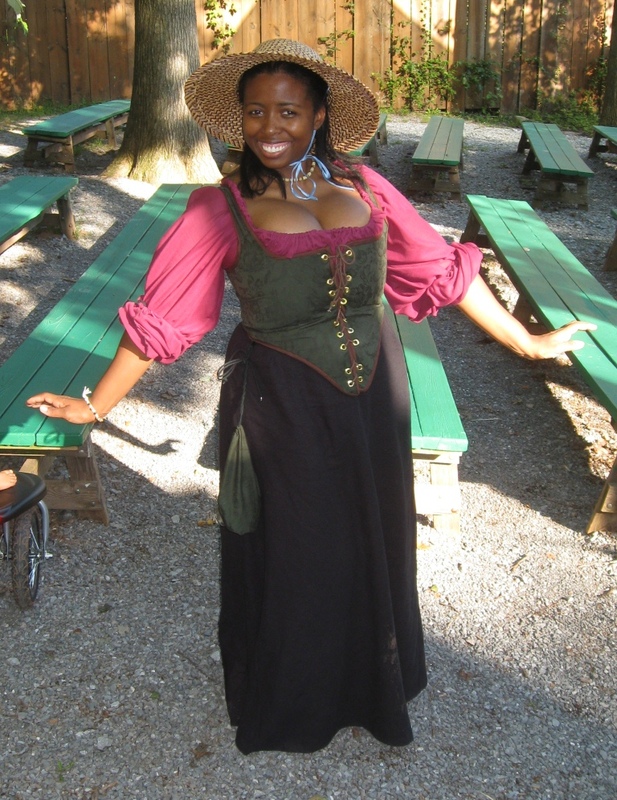 I only had one pack on hand, and I’d hoped to go to faire the next day, so I wanted to finish. No worries though; I’d already marked the placement, so I just have to get the grommets set. The wench-y purple chemise is from Jennifer Thompson’s Easy Italian Chemise tutorial. Since I had just a bit of remnant left, I made a quick pouch, embroidered with Celtic knot work. The metallic thread makes the design pop. I love it! As soon as I find my brown grosgrain ribbon, I’m going to add a loop to the inside lower right edge of the bodice, above the binding. 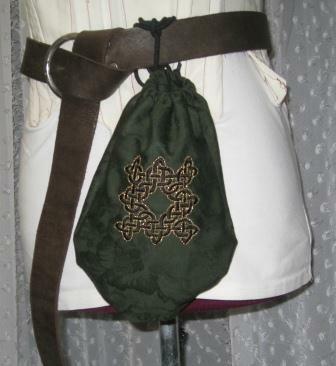 Then, I can tie my pretty pouch from the bodice rather than wear a belt. 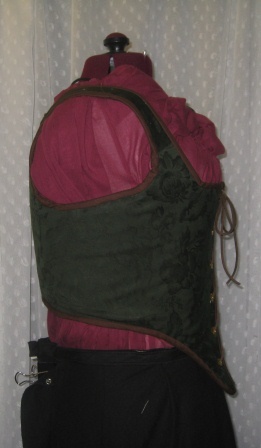 The bodice needs reconstructive surgery to fix the crease that formed during the first few hours of faire.